Okay- I’ll admit it. I kinda sorta maybe love watching cooking shows on TV. Doesn’t everyone? Ina Garten is one of my favorites to watch because her recipes are pretty simple yet incredibly delicious. (Oh and in case you are confused so far- Ina Garten is otherwise known by the name of her show- Barefoot Contessa.) The following recipe is based on hers but with a few little twists based on my own family’s taste preferences. The dressing is yummy and the hardest part the recipe. That being said, I tend to make the dressing the day before just to make my day a little easier if I’m cooking for a large crowd. It saves a ton of time and makes your day easier! Also- the dressing is OMG delicious on its own. My husband likes to take slices of Italian bread and coat it with the dressing before tossing it in the oven for a few minutes. Delish! Place shallot, lemon juice, mustard, vinegar, salt, and pepper in a food processor and process for a few seconds. Slowly add olive oil while your food processor is running (if you’re using one without a pour lid, just make sure you process the dressing for a few seconds after adding the dressing to mix it well. Remove from oven and allow to steam. You can place them in a paper bag and seal closed for 10 minutes, or take a large bowl and use it to cover peppers on the counter. Add artichokes to bowl and toss until well coated. 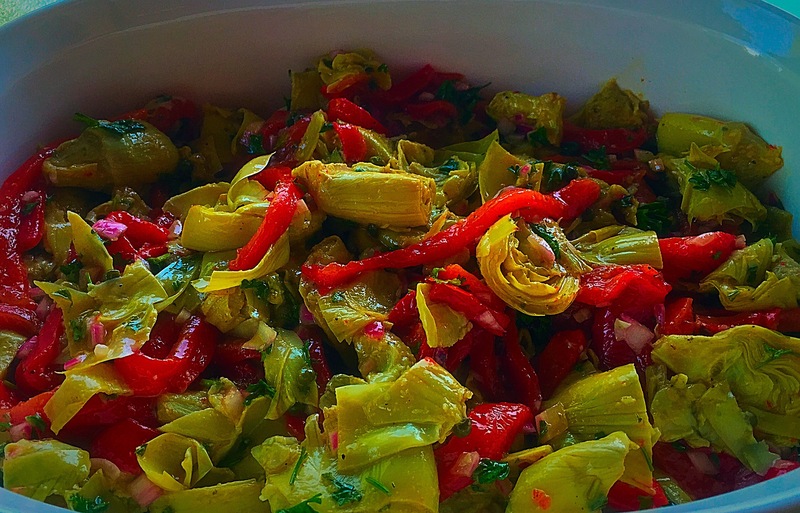 Place artichokes on a sheet pan and place in the oven for 20 minutes. It is okay if they are touching, but make sure that there is only one layer of artichokes otherwise they will not roast evenly. add red peppers, red onion, parsley, vinegar, and red pepper flakes.